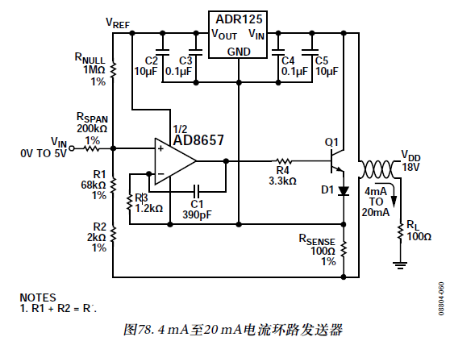 I read Datasheet of AD8657. "For example 1 kΩ of feedback resistor and assortment of 1 MΩ of load cause load resistance equivalent in 999 Ω as a result by an output. What amplifier would you recommend for a low power 4mA to 20 mA current loop transmitter application? RE: Which reference should be used with the AD5541A/42A? Suitable external references include the ADR421 and ADR431.Both are low noise reference sources and have the required noise/accuracy level to achieve the best performance from the AD5541A/42A. Thanks Hugh, sorry for the late respond. Because I can not understand fully for other choices. It is high risk for me. RE: What is the proper Rf value for AD8130? Stability is really a function of the output impedance and the capacitive load.